The Swiss 20 Franc Vreneli gold coin is one of the most popular european coins, and was issued between 1897 and 1936, in 1947 and in 1949. The informal name for the range of legal tender gold coins produced in Switzerland is Vreneli. In English, the formal name is Helvetia Head. 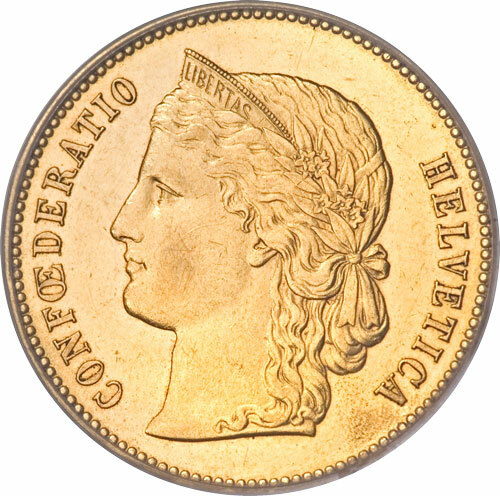 The Swiss Francs are sometimes called “Swiss Miss,” from the obverse design with the maiden Vrenelli’s face adorning it. She has braided hair and is wearing a string of flowers, with the majestic Swiss Alps looming behind her. The Swiss 20 Franc coin’s reverse shows the Swiss shield, featuring the Swiss Cross, and a wreath of oak bordering the shield. The coins were minted at the Swiss Mint at Bern and the coins are mint marked with a “B”. In 1935, 175,000 strikes of the 20 franc coins were produced. However, an additional twenty million coins dated “L1935B” with the “L” indicating “lingot” or bullion and the “B” indicating the Bern mint, were re-struck in 1945 (3,500,000), 1946 (7,108,813) and 1947 (9,400,000). An additional 9,200,000 coins struck and dated in 1947 were also produced and are distinguished by the mint mark “B”. There were no regular strikes produced in the years 1945 and 1946.